We now return to your show! Mysterious Orb: I am no one. However, you <Character>, are someone whom I find very interesting. Mysterious Orb: It is a shame you do not possess a Doom Weapon. A <Class> as powerful as you deserves an equally powerful weapon. Mysterious Orb: Only a true hero like yourself should be trusted with a Doom Weapon. Their greatest powers have yet to be unlocked. Mysterious Orb: Your Doom Weapon is exquisite. It will continue to bring you evan more power. In time you shall become unstoppable. Mysterious Orb: It's a shame. Mysterious Orb: You wish to increase the power of your Doom Weapon using 5 Unlucky Doom Essences? Excellent! Mysterious Orb: If you have not upgraded yet, travel to Crystal Clear Lake in Amityvale and speak to Chaney in his shop there... then return to me. Guardian Jenni: Welcome to Falconreach, the town that is connected to all of Lore! Guardian Jenni: If you are new in town, you should talk to the little red moglin. He usually knows a lot about what is going on. Guardian Jenni: Also, be sure to check the Daily Dragon posting in the center of town often. Every week something new is added! Guardian Jenni: You find shops for weapons and potions, a barber shop, and many more. Also, check out Cysero's Superstore of Savings! Guardian Jenni: He's a little weird but he usually has some really interesting stuff for sale. Guardian Jenni: The citizens of Falconreach are from all over. People tend to come to visit, and end up never leaving. Guardian Jenni: It's a great town with a good vibe and lots of action. Guardian Jenni: If you would like faster means of travel than your own two feet, you may ride our gryphon, Peter. He can be found near the Guardian Tower. Guardian Jenni: There are many places, however, that are only accessible by foot. Just follow the scent of adventure! Guardian Jenni: Oh, and before you leave, be sure to rest at Serenity's Inn. The beds are almost always clean, and she makes a mean cup of cocoa! Guardian Jenni: There is a map there as well, so that should help to get you oriented. Guardian Jenni: My pleasure. Enjoy your stay! Guardian: If you are looking to rest, try sleeping at the Inn. You might even want to explore the town at night anyways. Guardian: What, you don't know?! I'm a Guardian! Guardian: Sure, technically I'm a knight but our scope of duties and obligations are much larger. Guardian: However, mostly my job is to protect this town. It has seen its share of war, and it needs someone to fight for it. Guardian: Well, I was guarding the East gate the other day and met a hunter.. Guardian: He had just come from Doomwood Forest and was bragging about how much money he'd made off of monster pelts. Guardian: Aye, but I can't imagine who he could have sold the pelts to in Doomwood.. That forest holds nothing but evil. Guardian: Did you know that at night, there are all kinds of weird glowing things in the park? There's even a portal that only works after dark! Guardian (1): Come on, rookie, get your guard up! How are you ever going to defend the town if you can't defend yourself? Guardian (2): Whoa, that was deep. Guardian (2): Welcome, <Character>. If you wish to travel quickly, you may use our gryphon. He is to your right. Guardian: Everybody here knows who you are.. you slayed the hydra on Arborvale bridge! B.M. Moglin: Pssst. Hey, you. Yeah, you. I'm the Black Market Moglin, stranger. I hear you want to change something. Maybe I can help. B.M. Moglin: Need to change your name? I have the papers for that. It'll cost you 1000 DC. B.M. Moglin: You want to change gender? I know a spell. It'll cost you 1000 DC. B.M. Moglin: Want to change your class? I've always been a fan of magic myself. It'll cost you 500 DC. B.M. Moglin: Sure... I can upgrade certain weapons. B.M. Moglin: Meh, sure, I might have just the thing to upgrade those items. B.M. Moglin: Ah, the Shadow Armors... some of my favorites. B.M. Moglin: Psh... I don't deal in living things... especially cute ones. Go see the Pet Trainer on the other side of Falconreach for that kinda stuff. Ash: Hi <Character>! I've got some new information for you! I guess a hero's job is never done. Ash: I've finally decided, today is the day! I'm going to do it! Ash: I'm going to go and become a knight, no matter what it takes! Ash: But you already know that. You can play ArchKnight by logging out and selecting me (Ash Dragonblade) from the character selection list. Ash: What would you like to know? Ash: There is always a lot happening here in Falconreach. Ash: Aria went wandering to look for rare pets and I haven't heard from her in weeks! Ash: These letters arrived for you. Ash: Look out! Hey lady, move aside! Mail Delivery coming through! Watch it people! Ash: Mail Delivery coming through! Get out of the way, people! Alta: If you are bored, you should try doing some fishing. I've heard a lot of crazy stories about it lately. Sir Jer: Hail Zharth! How have you been, friend? Zharth: I've been well, Sir Jer! Still sewing up a storm? Sir Jer: Aye. So, what brings you to Falconreach? Zharth: Well I hoped a caravan from Moonridge just to get away from the monotony of guard duty for a while. Zharth: I figured I'd take in some sights, and maybe attend an auction while I'm here but the items weren't to my liking. Sir Jer: Hah! A well-earned vacation, I'm sure. I too came to attend an auction but alas it is as you have said. Sir Jer: They often bring in new items, however, so it is worth your time to return. Sir Jer: I spoke to the owner, Gris. He seems t be an interesting fellow.. I believe he will bring in some unique pieces. Zharth: Fantastic! Hey, lets go grab a smoothie at the Inn and gripe about our jobs while we wait for the next one. Bastantus: Lana, this mission is important. You must obtain it and bring it back to prove your courage. Brump: Heh, the harbour is always so busy this time of day. Even the fish are biting! Twilly: Have you heard of the Priestess, Lady Celestia? She was supposed to meet me here. Could you ask Rolith in Oaklore Keep? Twilly: Hiyas! Want to look for the Black Dragon Box? You should ask Robina the Hood, she knows everything about hunting Sneevils! Twilly: Oh noes, the Black Dragon Box was empty!? Oooh I know! You need to visit the most famous Treasure Hunter in the land! Twilly: 5 eggs? Wowzers! Which one is the real dragon Egg? I know, use the portal and ask Warlic the mage to help! Twilly: Amazing <Char Name>, you have the Dragon Egg! We better put it in a safe place. Hmm... I know a secret cave! Twilly: It is time! It is time! Quick, let's go to the cave where your Dragon egg is! Twilly: Did some one say cake? No cake please!!!!!!! Cysero: Hiya! I'm Cysero, the Mad Magical Weaponsmith! If you are looking for the highest quality items, step inside my Superstore of Savings! Cysero: As I said, I'm Cysero, the Mad Magical Weaponsmith! I travel the world looking for rare magical materials and spells. Cysero: I use those to create amazingly powerful weapons, armor and items that I sell for Dragon Coins! These items are the best! Cysero: But I really just use the store to fund my various magical experiments! Yesterday I made a dancing sandwich! Neat, huh? Cysero: <Character>! Feel like going on an adventure? Cysero: Oh, your left sock? Of course I know where it is. It's.... OHHHH you almost got me that time. You won't get it from me THAT easy! Heh! Cysero’s Orb: If you want to visit someone's house, just enter in their Character ID below, then click the VISIT button! Cysero’s Orb: "Greetings Shopper! The Home Of Your Dream Awaits You!" Sorry, I have to say that. Cysero’s Orb: With all the heroes of Falconreach clearing out monster in every direction, a lot of land has recently been declared safe by King Alteon! Cysero’s Orb: The King asked Cysero to create a special "real estate orb" to help the heroes find their homes. That's where I come in! Cysero’s Orb: If you need anything... just let me know! I'll try and get you the exact home that you're looking for! Cysero’s Orb: Here are three basic starter home styles that you have to choose from. When you know which one you want, click the Buy A House button! Cysero’s Orb: Ready to buy a new house? 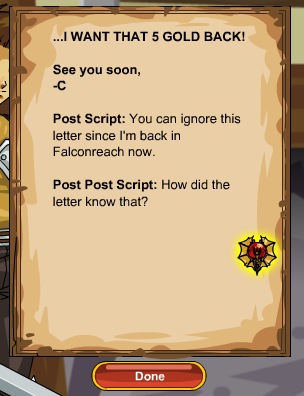 Guardian Fred: Oh, before you go... Don't forget to check the Daily Dragon news post in the center of Falconreach often.. It gets updated every Friday! Guardian Fred: Oh, just fine now that my shift is almost over. What a day! Guardian Fred: Just a long day of dealing with merchants and traders on their way in and out of town. They can be a rowdy bunch. Guardian Fred: This one merchant, Phil. He gets on my nerves with that little dance he keeps doing. Guardian Fred: Nice guy n' all, but oh my gosh just let me work here. Y'know? Guardian Fred: Well, you can fish right here in Falconreach, actually. If you head up towards the Guardian Tower there is a road that connects to the bay. Guardian Fred: I've heard that the fishing is good in Amityvale as well, which is to the South. Guardian Fred: Try going North towards Verteroche Crossing. The people there are kind and there is usually some employment opportunities. Guardian Fred: Further North you will find Archmage Warlic, Lymcrest, and other towns. Guardian Fred: Alternatively, you could head East and visit Moonridge and The Sandsea to name a few. Guardian Fred: But Beware of Doomwood Forest.. it is an extremely dangerous place. Guardian Fred: Aye. You know what they say... "All roads lead to Falconreach". Lira: Welcome to the new Falconreach Bank! How can I help you? Adeline: It's so peaceful here. Annapurna: Have you come to see the statue? Annapurna: Oh, me too! This is my favorite place in all of Falconreach! Annapurna: Every day I come here... it's my spot. Annapurna: Yeah.. well it is. But that's not why I come here. Annapurna: Some day, I'm going to become a SUPER GREAT mage like Warlic! He is my hero! Annapurna: What, you don't think I can? Annapurna: Really?! Sweet! I'm going to train every single day! Annapurna: Some day I'll be just as strong and brave a mage as Warlic is! Then I can help defend the town when we're in trouble! Annapurna: Heehee! You're really nice. Would you like to have some of my spellberries? Annapurna: Yeah! All the great mages eat them. They help to make your magic stronger! Want some? Annapurna: Don't you know that moglins are good at magic? Most of us have inherent magical abilities! Annapurna: Oooh! I'll show you. Just you watch! Annapurna: Oh, are you new to Falconreach? Annapurna: Oh, then welcome to Falconreach! There is lots to do, so you won't get bored. Annapurna: Well let's see.. Ash and Twilly always have lots of things going on. You can find them near Serenity's Inn. Annapurna: Or you could check out the shops. Patch's barber shop is just down the road a little bit, and so is the bakery. Annapurna: Reens and Alina run the potion shops to the left of Serenity's Inn. They can probably find you something to do as well. Annapurna: Oh and there's-- There is a lot more, but you said you like to explore so I'll let you find them all. Annapurna: Oh, so you just came to relax a little bit, huh? Don't worry, I won't bother you. Miguel: There have been some shady characters prowling around here at night.. I really wish the Guardians would find out what is going on. Miguel: They're up to no good, I tell ya! Miguel: Heh! Never a dull moment with that boy around! Carri: Well, I did hear some news about that guild of archeologists, Ancient Dreams. Carri: Recently one of their members un-earthed a tomb in Doomwood, but no-one has been brave enough to enter it! Carri: Either you're nuts or you've never been to Doomwood Forest... Only a seasoned adventurer would dare to do something like that. Carri: Usually they hire adventurers they can trust to clear out the place first, and then they check it out. But nobody wanted this job. Carri: Well, if you do I'm sure Ileon would be happy. Carri: He's the archeologist who led the team that found it. He was really mad when they couldn't find anybody to clear the place. Carri: No, sorry. Ancient Dreams has members excavating sites all over Lore, though. I'm sure you'll run into one of them some time. Carri: Well, he's the one who found Riverine Keep and Siren's Anchorage, to name a couple. Carri: Yeah, and those are just the ones I know about. I'm sure there are more, Ileon's very famous. Carri: One of these days I'll get out of here and explore some of them.. but for now I'm just enjoying living in town. Carri: Oh, well.. I don't know much about it really. Whatever used to be there has crumbled to dust, but underneath lies a labyrinth. Carri: It's way up North-East of here. I'd take the gryphon if I were you.. that's a very long walk. Carri: There's a small inlet off the bay, where the ruins of a temple were discovered. Powerful magic resides there. Carri: Sorry, that's all I've heard about it. If you want you can ask Jabel, he's the one who told me about it. Carri: You'd need a boat. The whole place is nested against the shore, and flanked by mountains. Irwin Dundee: 'Oy there! <Character>! Crikey! Want to find out about rare and elusive monsters?! Irwin Dundee: Have you seen the fantastic FalconsNest Monster Zoo? They have turducken! Irwin Dundee: 'Oy there! <Character>! Crikey! I hear the Guardians are working on fixing the Zoo up! Irwin Dundee: 'Oy there! <Character>! Crikey! Have you been to the Zoo yet? Irwin Dundee: You need to go explore and learn all about the monsters there and, then, maybe, if you feel up to it, you can help me get 'em some monstercize! Merchant Cyan: Ahh, I love this town. Every time I head to Oaklore I always take a moment to rest here. Zevox: Greetings, <Class>, and welcome to the luminous Theater Celebritay! Where EVERYONE has a chance to shine! Zevox: Welcome to The Making of Falconreach Idle, with your host, ME, Zevox, TheaterMaster Extraordinaire! Zevox: George Lowe and staff members Cysero and Lim all voiced their own NPCs. Zevox: Serenity, the character, was voiced by Alina while Lime the moglin was voiced by Nythera! Zevox: Artix voiced himself in the commercial between acts 1 and 2! Zevox: You might have some questions for your opponents, too. I can answer that! Zevox: When we use your character in a cutscene, we have to have a character model stand-in for you during the animation. Zevox: As the game grew more advanced, so did Mr. Guy. He finally got a total overhaul and became his alter-ego, Mr. Green Guy. Zevox: Mr. Green Guy can do a bunch of cool things that you, the player, never see but which makes him REALLY useful in cutscenes! Zevox: Mr. Test Guy is used to make sure we have the monster scaling right when drawing and animating monsters. Zevox: Regardless of how the Guys are used, they're ALL your stunt-men, standing in for you until we're ready to have you play your own part! Vickie: You know, I heard that Galanoth gave something of his to the Auction House. The proceeds will be donated to something nice. Nesh: You're in my personal space, bub. Sheppie: How've you been, friend? Guardian Rikah: Good, good. I just got transferred here. It's nice to finally get a chance to relax a little. Sheppie: Oh? Where were you stationed before Falconreach? Guardian Rikah: I was part of a battalion charged with guarding some of the caravans carrying food into Swordhaven. Sheppie: I see, how interesting. Guardian Rikah: There have been reports of increasing numbers of bandits near the capitol. Sheppie: So... you and your team were successful in staving them off, I assume? Guardian Rikah: I'm not entirely sure, actually. Guardian Rikah: Well, in the time I was there we didn't see a single bandit. Sheppie: Hmm. Maybe they heard the guardians were coming and decided to stay away, then. Guardian Rikah: Something about it still bugs me though..
Gretel: Mmmmm, hello there, young one... feeling a little peckish? Gretel: I am Gretel, little one. You look hungry. Very thin. You need to eat more. I can fatten you up with sweets and pies. Galliver: W'hey there, friend. If you know somebody who needs farming equipment, send em' to me! Mage Elros: *Sigh* Why do I always get stuck with the menial tasks in this party? That blasted meat shield could be doing this while I study spells. Trinki Bell: Capes and wings! Necklaces! Rings! Come and buy my pretty things! Verlaron Knight: The Knight Captain of Verlaron has sent me to claim a certain item from your battalion. To whom may I speak to about this matter? Guardian Mekiai: For the love of all that is sane do NOT touch that, <Class>. Nor the undead cannon. Artix: Greetings Ash! I hear you are following your dream of becoming a Knight. How can I help? Artix: So an adventuer told you that all you needed to do to become a Knight was save a Princess? Artix: Sounds fun! I am really impressed that you battled the Necromancer and his undead minions on your own. You have come a long way, Ash! Artix: Frozen girl? *friendly chuckle* Did you really get your lips stuck trying the Sleeping Beauty technique? Artix: It was brave of you to save her. But do not be dissapointed if she is not a Princess. I have been to many Kingdoms yet, I do not recognize her. Artix: I will see what I can learn about her while you train. Good luck, Ash! Artix: How ironic, Ash! Normally you are the one who gives me quests when I am looking to go on a quest. Serenity: Are you sure you want to set Falconreach as your home town? Male Guest: Hello! How are you doing? Cysero's Orb: If you want to visit someone's house, just enter in their Character ID below, then click the VISIT button! Cysero's Orb: "Greetings Shopper! The Home Of Your Dream Awaits You!" Sorry, I have to say that. Cysero's Orb: With all the heroes of Falconreach clearing out monster in every direction, a lot of land has recently been declared safe by King Alteon! Cysero's Orb: The King asked Cysero to create a special "real estate orb" to help the heroes find their dream homes. That's where I come in! Cysero's Orb: If you need anything... just let me know! I'll try and get you the exact home that you're looking for! Cysero's Orb: Here are the three basic starter home styles that you have to choose from. When you know which one you want, click the Buy A House button! Cysero's Orb: Ready to buy a new house? Twilly: Hiyas, Ash! Any luck with your frozen friend? 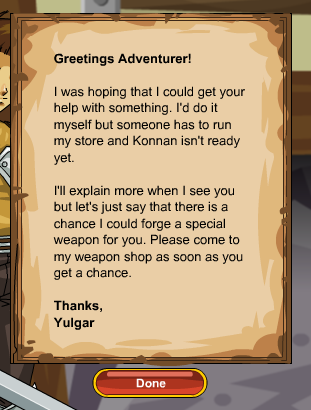 Yulgar: Well met, Ash! Feel free to browse the store. I make and sell a wide variety of weapons perfect for an aspiring Knight. Yulgar: Do you want to quest for Ahzite Ore? It can only be found in the jungles of the south, but if you can get some I could make you new weapons! Yulgar: The local lumber mill is late on their delivery. Do you have time to stop by and see what is wrong? Mysterious Stranger: I have nothing for you. Warlic: Ash! It's good to see you again. I have something to... discuss with you. Warlic: Artix has informed me of your friends issue. I believe I can help. Warlic: First though, there are three necromancers in the surrounding area whose magics are disrupting my own. Warlic: You must venture forth and defeat them if I am to be able to help you save the girl. Warlic: The three necromancers have been defeated and the air is clear. I am ready to start my spell, Ash. Warlic: I'm sorry, Ash. Neither I or Artix have been able to find any information on your mystery girl. Warlic: If she is a princess, no one has reported her missing. I think it's much more likely that she's just a girl who got lost in the woods. Warlic: If you're still looking to save a princess though, I know of someone who might be able to help you, Ash. Warlic: Head over to the eastern park, you'll find them there. Hero: Hi Ash! Artix and Warlic have told me you're ready to start on your journey into knighthood. Hero: I'll do what I can to help you on your way. If there's a chance to save a princess you're more than welcome to come along with me! 1. You can invite Geo and Twilly to your party (disappears if you logout). 2. When trying to access the Guardian Tower, "*cough* needtobeaknight *cough*" is shown. 3. 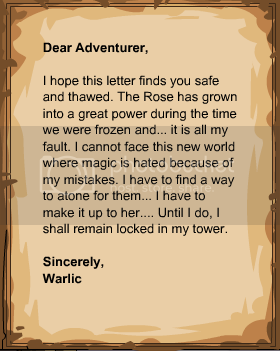 Warlic's "Portal Open to Knights only". 4. The Gryphon is there, but trying to ride it will result in "You must be this tall to ride (oh, and a Knight)"
5. The majority of the townspeople are away fishing or doing something Fishing-related. 6. Surewould Forest, the Harbor, and That A' Way are blocked by logs. Guardian Kris: I was planning a trip to Willowshire and when I got on the road, it was like it had gotten longer overnight! Weirdest. Thing. Ever. Guardian Ashlynn: Some day I am going to be an adventurer like you... but not yet. I have a lot to learn, and right now I can do more good fighting with the Guardians. Guardian Mok: Did you know that there are trinkets which boost your stats, while others give you special abilities and spells? They require a Dragon Amulet to use, however. The Lady: Hello, <Class>. I have just arrived in town to sell special weapons created by my husband on Sho'Nuff. Would you like to see? Guardian (1): Justice never sleeps! The Guardian Tower must remain open whether it be rain or shine, night or day, war or peace! Guardian: Hail, <Character>. What business have you with the town's armory at this hour? Dirk: *sigh* What are we going to do now, Rat? Dirk: And then you almost drown me when you fell in! Rat: That wasn't my fault! You know how I get around water! Dirk: My underpants are still soggy! Dirk: I SQUISH when I walk!!! Rat: We could go battle some monsters. Dirk: Nah, too much work. Dirk: Gosh, this was supposed to be so easy. Rat: Hey-hey, did you see the cute girl working at the bank? Dirk: Rat, focus! Hmm, wait a sec... This gives me an idea. Rat: Dirk... I know that look. Rat: I don't want 'bank robber' to be on my resume. Dirk: Ok, new plan: Let's see what we can sell and use that money to buy something pretty at the auction house. Dirk: Because cute girls that work at banks like pretty things. Hehehehe. Dirk: ...And then we get rich, buy even better weapons, and pick up where we left off! Cysero's Orb: ...Did you hear something? Cysero: Probably not. I was listening to the sound of my hair growing. Fomos: Troubled? No, not really. I'm just making sure I have purchased everything I need for my journey tomorrow. Fomos: Well, I'm on a mission from a hunters guild to deal with some monsters threats that are stopping trade ships from running the seas. Fomos: Darned things have got the sea-faring merchants so scared that they won't dare get on a boat, and the towns need those goods. Fomos: They need every hunter they can get. If you really want to help, head to Hunter's Paradise and speak to Karina. Fomos: You've never heard of Hunter's Paradise? Fomos: Geez, it's only the place all the great adventurers travel! It's an inn, in Doomwood Forest. Fomos: Aye, but that is part of the reason it's so popular with that crowd. Only a seasoned adventurer would dare to travel there. Fomos: Sure does! Ol' Teral has the best ones though. He's the owner, and a retired monster hunter. Oh if only I knew what he knows! Fomos: I doubt he'd mind... he just love to reminisce about the "good ol' days", haha. Fomos: You should see some of the stuff he makes out of monster hides, too. He's spent a lot of time living off the land. Fomos: No problem. I'll be seein' ya. Sammers: ... Get out of here, <Class>. Guardian Elgeon: Hydrascale Brook empties into a small lagoon behind the academy. It must be quiet serene at night. Cinante: In your travels, have you by chance come across some darkite ore? I'll trade you something nice for a little. Cinante: Ah. Well, please remember me should you ever find some. Oscar: Ugh. What a despicably cold evening. 1. You can access to Ravenloss by using the Portal nearby the river. Kruchhusten: We're outside the borders of your town. Leave us be. We will stay... ugh... peaceful. Guardian Jenni: Oh, and before you leave, be sure to rest at Serenity's Inn. The beds are almost always clean, and Spruce makes a mean cup of cocoa! Ruby: Hello there! Ruby, the Adventure Chef, at your service! Broil on! Ruby: I'm Ruby, the Adventure Chef! I'm a moglin. And a chef. And an adventurer! I've loved cooking and exploring ever since I was small. Smaller. Ruby: I travel all over Lore looking for rare delicacies and ingredients for use in cooking the most amazing dishes. Ruby: Of course, there are some dangers involved. The occasional unbread, hungry beasts, bandits, traps, the usual. Ruby: I'm sure you know all about those sorts of things, hero. Ruby: I used to travel with my brother, Rudy, but there was an incident with a fire elemental, a tog, and a couple spatulas. Ruby: I'm not sure what he's up to these days. Ruby: But hey, that just means more food for me to adventure! Ruby: I lost it in a cooking accident. Ruby: Turns out some beasts don't like being pan-fried in an herb-infused moglinberry juice reduction. Who'd have thought? Ruby: The food I sell is all... edible! Some food I've collected from the depths of Lore, others I cook to order. Ruby: My ingredients are always the freshest, except when they're well aged. And always humanely treated, except when they're not. Ruby: I've never tried a hero steak before. Ruby: That was a joke. Ruby: Unless you were willing to... no? Definitely not? Are you sure? I'm not drooling! What were we talking about? Right, my food! Ruby: Probably want to pick out anything that's glowing bright neon colors though. That's not normal. Unless you want it to be. I won't judge. Ruby: I have a wide selection in stock, all for the fairest of prices! All organic too, except for what isn't. Ash: <Character>! I... I am so happy to see you again! Lore itself has missed you! Ash: When you were frozen, <Character>... I had to become the hero I always wanted to be. Ash: I knew I had to become a knight, no matter what it took! What is a Dragon Amulet? Ash: A Dragon Amulet is an item of great power. It allows you to use the strongest weapons, most powerful items and enter special areas. Ash: Eventually a Dragon Amulet will unlock special classes, and allow you to raise and control YOUR OWN DRAGON! Ash: There is only one place to get your Dragon Amulet. Where can I save my Item Settings? Ash: ...then you will need to talk to Malek in Guardian Tower on the hill. You will also need a Dragon Amulet. Where can I train my Stats? Ash: Every time that you level, you gain Stat Points which you can use to improve your skills. Sir Render in Town Hall to the south can train you. How can I get some DragonCoins? Ash: Dragon Coins are an ancient type of coin once used by the Great Dragons. Right now there are only 3 ways to get them. Ash: The first way is to purchase them from www.DragonFable.com. Ash: The second way is easy. You get some Dragon Coins anytime you purchase a Dragon Amulet. Ash: The last way to get Dragon Coins is to win some from contests held on the DragonFable Forums! Where can I spend Dragon Coins? Ash: If you already have some Dragon Coins you can use them at Cysero's shop to the east. You can buy powerful weapons or inventory slots, right now. Ash: The fastest way to get a pet of your own is to talk to Aria, the pet trainer in Falconreach. Her shop is to the east. Where can I refill my potions here? Ash: Reens and Alina are the local alchemists. Their shops are to the west. They will refill your potions or train you in alchemy! How can I change my hairstyle/color? Ash: You can get your hair cut or recolored at Patch's Barber Shop to the south. He can even change your skin color. How can I change my armor color? Ash: The portal on the hill can take you to the Paint Fairy. She can change your armor color anytime that you want, but you'll need a Dragon Amulet. Ash: You can get Defender's Medals for defending Falconreach or anther town from invaders during a war. Ash: You can spend Defender's Medals at Town Hall for special items and pets that you can't get anywhere else. How do I set this as my home town? Ash: To set Falconreach as your Home Town, you will need to speak to Serenity. She runs the Falconreach Inn, behind me. How do I get the Guardian Class? Ash: In DragonFable, the Guardian Class is a special reward for people who have become Guardians in AdventureQuest! How do I get my own Dragon? Ash: Don't you remember? Your dragon is waiting for you by Twilly for ages. Go and talk with them! Ash: It's been a hard few years sice you've been frozen. I tried to be the best hero I could be, following your example. Ash: I follow the way of the light. My princess has even returned... at least, she's reaching out from the realm of light through my sword. Ash: I don't trust these Rose members... you should watch out for them, <Character>. Ash: You can explore Falconreach, by day or night, and find many others who might need your help as well. Ash: With so many Rose members in town... I'm feeling uneasy. Ash: I've heard that a hooded person has been lurking in Surewould asking for you... but they're wearing Rose colors. Ash: Be very careful, <Character>. This could be a good chance to learn more about what the Rose wants with Falconreach. Teleports you to SureWould Forest (Book 3). Ash: The Vind is a group of wind elves and magical creatures that fight against the Rose. Ash: Their camp is hidden somewhere in Betrubung Swamp, south of Falconreach. Wingtail: Arm yourself, hero. There be a battle brewin'. Sir Jer: Hail Zarth! Hve you heard from any friends in Moonbrook? Zharth: News comes slowly from that direction, Sir Jer! What of Oaklore? Sir Jer: Aye. The Rose has garrisoned a full group of trainees there by order of the King. Zharth: I still can't believe that Alteon supports ending magic... it seems so strange. Zharth: At least Falconreach still seems slightly sane... Although, it's getting crowded here. Sir Jer: It's the last large town to welcome any who practice magic without the supervision of The Rose. Sir Jer: It's said they even capture and chain magical beasts and make them fight for them. Sir Jer: A lot have said it's hypocrisy... but I hear they're only using magic until they can end it... for everyone! Zharth: That makes no sense! How on Lore do that plan to do that?! Sir Jer: No idea. They have some scholar that used to be a necromancer or a slave to the darkness realm or something. He's looking for a way. Dracelix: We should check at the Guardian Tower and see if we're needed, Isha. Twilly: Hiyas! Glad you made it here, <Character>! <Dragon> has been waiting a long time for you! Guardian Fred: Oh, before you go... Don't forget to check the jobs post in Serenity's inn. Farwyn: I have rare wares all the way from Dreamwood, <Class>. Crafted by the master smiths in the Manawood section of my home. Farwyn: Would you like to see I have? Caran: Do we know you? Diawe: We knew someone who looked like this one. Just less crazy. Miguel: They're up to no good, I tell ya! Wonder if they're parta that magic-hatin' cult! Merge Shop - opens Sielu's Shop. DC Shop - opens Sielu's DC Shop. DC Helm Shop - opens Sielu's DC Helms. Sielu: The essences will drop from the dungeons that the elementals are gathering in, particularly in the elemental foothills. Sielu: If you don't wish to gather the essences, or wish for the most powerful versions I can smith, you can see what I have available in my DC Shop. Sielu: I do have several weapons in the DC Shop that may become available for merges in the future... if you can discover the dungeons! Sielu: I am Metalliseos Sielu, leader, teacher and blacksmith. <Character>: Erm, Guy with gold wings? Sielu: What? Just because I am male, I should have some kind of masculine color? Our wings reflect our power and inclinations. Sielu: Gold, the refined colour of the most precious metal, fits me perfectly. It also reflects the intense fire I must work with. Sielu: My wings tell much about me. What does you ... physical make-up say about you? <Character>: You're a leader as well? Sielu: Yes, leader. There are many parts to the whole, young one. Sielu: Just as a machine must have many pieces to work, so must every good society. Sielu: The Wind Elves are made up of several groups that create a strong and unified people. I lead the artisans and crafters. Sielu: ...such as blacksmithy, metallurgy, jewelry craft and weapon design and creation. Sielu: Yes, these hands can craft even the finest gold and silver filigrees. Just because I wield a forge does not mean I cannot be artistic. <Character>: What is your impression of The Rose? Sielu: The Rose is misguided. Sielu: In this misguided perspective, actions have been taken that are more oppressive... painful than what magic has done in the history of this land. Sielu: Kara will be able to tell you more about the far reaching hand of the Rose. Sielu: There are... people out there, <Character>, that have been captured and punished unjustly. Sielu: And all of us have just stood aside and let it happen because they were not like us. But that is Kara's territory. Sielu: Kara is young, but she is passionate. She has been a great leader of all Wind Elves, especially in these trying times. Sielu: I was one of her mentors when she was a little girl, before her wings came in. She was always a bit of a spitfire though. <Character>: Would you make a weapon for me? Sielu: I can. What you want made will determine what you must find to make it successful. Stryche: Hey! I ain't never seen your face before. I'm Stryche, a traveling merchant. Stryche: HeroMart is Artix Entertainment's one and only real world loot store! Stryche: I've been collecting gear for a long time and some of it you can equip offline - t-shirts, calendars, action figures, and more! Stryche: Plus all the in-game rewards you can get with HeroPoints! Stryche: HeroPoints are HeroMart's new in-game currency -- anytime you buy merchandise from HeroMart, you'll get HeroPoints. Stryche: These points you can then use to buy additional in-game gear... that YOU pick and choose from the items inside my shop! Stryche: Lay it on me. Stryche: From the dawn of time I came, lived many lives, fought in many wars... but that's a story for another time. Stryche: Why does the moon come up at night? Maybe just to tease us with its power, or to simply guide the weary travelers throught the curtain of the night . Stryche: There I go rambling on again. Forgive me, what was the question? Stryche: Her name is Vajra. A long time ago she blazed like a meteoric fireball across the sky, in a maelstrom of thunder, fire and lightning but that was long ago. Stryche: If there's ever a need for Vajra's power, I shall wield it once more, but those would be grim times indeed. Stryche: The beast that she awakens does not always bring tranquility, but at times destruction that follows it. <Character>: Odd, it looks like a portal but it doesn't seem to function. The Maleurious - presents you a scroll that acts as a small hub for The Maleurious Saga. Invite as Guest (DA Required) - Adds Uaanta Fayt to your Friend A slot. Airheart: Popsprocket is... gone. I don't want to talk about it. Airheart: Popsprocket is... gone. You have to help find my friends! Merchant Cyan: I'm sick of these Rose members. I can no longer travel freely with their kind harassing me! Oregold: Watch it, Old Man. Magic is ending. It's too dangerous for people like you to try and control. Vickie: I wish Demento was still here... we could use as many heroes as we can get. Sheppie: Where are you from, Northerner? Stribog: Just north of Dragesvard... Is it always this warm here? Guardian Rikah: It gets colder during the winter... sometimes it even snows! Guardian Rikah: Colder? Don't you see all the snow? Stribog: But.. this is it? Sheppie: Depends on the weather, yep. Probably why we don't really see many of you ice elves this far south. Stribog: It is just so warm. I... I should probably find something other then leather armor. Sheppie: Some nice shorts, a linen shirt, yep, that would probably help. Guardian Rikah: It might be cooler down by the water. It's... busier there though, and a lot less... secure. Stribog: I have no desire to be anywhere near the water. To many of ... them there. Guardian Rikah: Swordhaven is under the fist of The Rose now. Falconreach is the only large town that even tolerates magic, I hear. Gretel: This is Sir Loin... my tall, dark and hirsute friend from Oaklore. You aren't wearing red are you, dearie? Gretel: We can cook many things, some of the more complex dishes may even help you fight better... I'll even tach you how to make them yourself. Mage Elros: *Sigh* Of course they want to end magic now... man, rouges get all the breaks! Custodian Orb: Well hello there! You look just like the type of chancer I'm looking for! Custodian Orb: Yes, a bit of shambolic mess in there right now. Dare say yonks was the last time the place had a good dusting. Custodian Orb: The chap in there still needs a tick before the place can open. Custodian Orb: The Libreseum is open! Loremaster Teka is inside now arranging the shelves and exhibits. Custodian Orb: As time goes on, more books and items will go on display. Custodian Orb: Come across a lot of scrap on your adventures, don't you? If you're very lucky, sometimes you might find something pretty wicked, and old. An artifact. Custodian Orb: If you do, bring it to me and I'll have it restored and ready for use in a jiffy! Blooming things haven't been used for donkey's years. Custodian Orb: Once restored though, you will find them enhancing some of your abilities. A shrine erected to, what you assume is, the Avatars. 2. 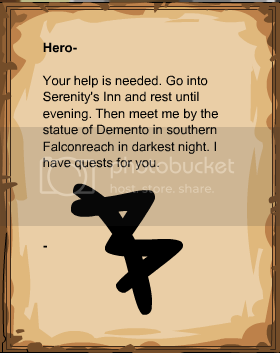 Falconreach Libraseum can be accessed from Southern Falconreach, beside the Custodian Orb. 3. Access to The Inn at the Edge of Time by clicking on the rift opening in the sky at the center of the town. 4. Access to Green Screen at South Falconreach by the Theater. Aeron: Ah, <Class>, have you found sanctuary here as well? Aeron: I was the Dreamwood ambassador to Swordhaven... but elves are... less than welcome there at the moment. Tinker: Want to check out what I have for sale? Batoro: You've been gone a long time, hero. In the wake of your absence, this town needed... it deserved a hero to fight the evil that lurked in the night. <Character>: And you're that hero? Batoro: I do what I can, but now... now I need your help or Falconreach will be overrun with villains! Batoro: There are five nefarious villains that hide in the shadows of nighttime Falconreach. You have to help me find them. Cinante: Have you found a source of darkite ore yet? Cinante: *sigh* Well, if you find some, let me know. Mysterious G.: I hate camping... Even in if I have the latest metallic fiber Gnome-B-Dry Outdoor Shelter 42B. NOTE - Book 3 Tomix can now be accessible from Pellow Village. Tomix: ...<Character>? So it is true, you are alive and well! These past few years have been really tough for all of us. Tomix: There is a lot I need to tell you <Character>, but this isn't a good place. Come talk with me in in Pellow Village once Ravenloss is open. Tomix: Right now, I'm helping with clearing up monsters that came through the Equilibrium Gate from the Void. Tomix: Once the situation is under control, the undercity will be safe to visit. Tomix: It seems the Equilibrium Gate cannot be closed, and the Void is bleeding through it. Unfortunately, I can't find a way to stop it. Tomix: The area around the gate is off-limits, for the safety of people living in the city. Tomix: I've banished her... that's all you need to know. That was two years ago though, since then I'm here, helping rebuild Ravenloss. Tomix: You see, spiritlooms are not supposed to break. The ones I had were already damaged because of what was sealed within them. Tomix: Eh, cutting to the chase, I lost my hands. My physical, material hands. What you are seeing here, is my soul. Loads a preview of the Master Soulweaver Armor. -- King Desoato for the name correction. -- Peachii for additional quest links and corrections. -- Slayer Zach for additional dialogue. -- Gabriel Castro for a correction. -- .Shadow// for addition of Basilisk Cave and The Yaga Sisters. -- Pink_Star for quest links. -- ILmaster13 for additional quest link. -- Sasuke Uchiha for correction. -- Peachii for additional links. -- Voodoo Master for writing the entry. -- Azan for info and corrections. -- Occavatra for hover-over text. Many of the credits were lost in the process of creating the Book 3 Falconreach entry. We are truly sorry, and thank everyone who submitted information and is not mentioned here.